In Michael Mann’s crime epic Heat, Robert De Niro plays Neil McCauley, a professional thief who resides in—and presides over—a modern home of glass and steel overlooking Los Angeles. As with the home of William Petersen’s tormented detective in Mann’s superb 1986 thriller Manhunter, the space mirrors the man: It’s clean, spare, focused, and more than a little distant. Neil’s dedication to the job forbids any personal connections. His mantra: “Don’t let yourself get attached to anything you’re not willing to walk out on in 30 seconds flat if you feel the heat around the corner.” Yet Neil gets lonely like anyone else, and he’s drawn into a relationship with a graphic designer (Amy Brenneman), whom he takes to his castle in the sky. They kiss on the balcony. All around them, Los Angeles is arrayed as Neil sees it every night, as a display case full of beautiful, glittering jewels, there for the taking. On a screenwriting level, Mann hasn’t done much to establish this relationship, which is one of many in a film that employed about two dozen of Hollywood’s best character actors in 1995. But he doesn’t need to, because the image alone is so swooningly romantic, and so revealing of Neil’s tormented attempt to square his personal desires with his criminal philosophy. Despite the sprawl of its three-hour run time and its obligation to serve so many characters and subplots, what’s striking about Heat—and about Mann’s work more generally—is how it’s as architecturally spare as Neil’s house, and as clearly thought-through as one of his operations. Though Mann devotes several pages of dialogue to a meeting between De Niro and his co-star Al Pacino, he’s a minimalist as a writer and a maximalist as a filmmaker, an orchestrator of sound and image. There’s a pleasing symmetry to Heat, built into its conceit but filled out by the direction, which plays out a cat-and-mouse game with a seductive balance that transcends words. There’s a reason Mann’s films have become cinephile events, even lately, when thrillers like Miami Vice and Public Enemies have narrowed his audience to auteurists. (As my friend Jim Ridley, editor-in-chief of The Nashville Scene, once said of Brian De Palma: “I wish he weren’t so determined to turn fans into apologists.”) There’s a baseline texture to his work that’s always present, even in a misbegotten effort like The Keep: the elegant compositions, the thrumming ambience of his often synth-based scores, the seeming belief that capturing the milieu is the primary concern, and everything else will follow. His work on ’80s TV shows like Miami Vice and Crime Story made the medium cinematic, and his work with digital cameras on Collateral and the films that followed has helped salve the pain of losing celluloid, suggesting the possibilities ahead. But mostly, every new film is a trip back to Michael Mannsville, that sensual wonderland where heroes and villains, good and evil, collide on a titanic scale—and often have more in common than not. And except possibly in Titanic, there was no more titanic collision in the 1990s than the coming-together of De Niro and Pacino, the two most revered actors to emerge from the New Hollywood renaissance of the 1970s. De Niro and Pacino more or less shared leading-man status in The Godfather Part II, with De Niro as the Sicilian immigrant who establishes the crime family that Pacino, his brightest son, will continue after his passing. But they never actually shared the screen, apart from the dissolves that marry the past with the present. Mann fully understands the power of that meeting, so he holds off until the halfway point before sitting them in the same diner and having them rattle off dialogue that crystalizes Mann’s philosophy on cops and robbers, and the personal torments of men dedicated to doing good work, even on opposite sides of the law. Starting with the opening credits, which place De Niro and Pacino’s names side by side, Heat strikes a balance between the activities of Neil’s crew and Pacino’s men, trying to stop them. Also holding the balance are two extraordinary robbery sequences that bookend the first and third acts. The first brings the heat: Neil and his trusted cohorts (Val Kilmer, Tom Sizemore, and Danny Trejo) make the mistake of bringing a loose cannon (Kevin Gage) along on an armored-car job, and subsequently split the scene with three dead bodies in their wake. When Lt. Vincent Hanna (Pacino), an ace robbery/homicide detective, surveys the scene, he gets the details of the operation uncannily right, and directs his own trusted cohorts (Ted Levine, Wes Studi, and Mykelti Williamson among them) to shut down Neil’s crew. So begins a back-and-forth between the two men that has Neil planning for one last big score before slipping Vincent’s net and getting out of L.A. with his share of a $12 million haul. Mann puts his capital-letter Cop and Crook on equal footing in their personal lives as well as their professional ones, and gives time to both as their all-consuming obsession with work destroys their ostensible reason for doing their jobs. Vincent is on the downslope of his third marriage, and his neglect deepens the despair of a stepdaughter (Natalie Portman) who desperately needs a father-figure. Neil looks with envy at the wives and families his crewmates have established—even the fraught ones, like Kilmer’s contentious marriage to Ashley Judd—and takes the gamble of seeing a new woman, even though it violates the mantra that dictates his ascetic lifestyle. Neil and Vincent are orderly men, and Mann harmonizes their activities beautifully, but being human isn’t an orderly business. Opening up to other people means opening up to chaos and disorder. And that’s the other side of Heat’s symmetrical relationships: There’s Cop and Crook, Pacino and De Niro, Order and Chaos. We can admire Neil’s skill, as Mann does, while understanding that the criminal life he’s trying to lead—disciplined, elegant, orchestrated with multiple exits and down-to-the-second timing—is a folly from the start. It’s folly to bring an untested, unstable con on the armed-truck job. It’s a folly to steal bonds from a sleazy hedge-fund manager (William Fichtner) and expect him to buy them back without consequence. It’s folly to open up his home and heart to a woman he’ll have to leave in 30 seconds if he feels the heat around the corner. And it’s folly to seek revenge when self-preservation is the most rational option. “A man got to have a code,” Omar says in The Wire, but having a code, as Neil does, and actually abiding by it are two different things. Sometimes, the plan goes out the window. And that’s the other defining feature of both robbery sequences: Neil has them down like clockwork, but they unravel due to circumstances beyond his control. He can’t anticipate that three armed guards will get shot in the first job, and Vincent has enough of a bead on him to turn the bank heist into open warfare on the Los Angeles streets. Suddenly, the neatness with which he (and Mann) have planned out the operation collapses, and there’s an eruption of violence that neither Neil nor Vincent want, but that’s out of their control. The collision between these two men—and the larger-than-life actors who play them—naturally leads to consequences of mass scale. In Mann’s world, as in physics, for every action, there’s an equal and opposite reaction. Which brings us back to the scene on Neil’s balcony, and the shimmering city below. He has the skill to pluck those beautiful diamonds, which Mann and his cinematographer, Dante Spinotti, lay out with alluring sparkle. But the view from above and the reality on the ground aren’t the same. As Brad Pitt tells Michael Fassbender’s character in The Counselor, an existential crime movie of a more recent vintage, “If you think you can live in this world and not be part of it, you’re wrong.” Men like Neil and Vincent are experienced enough to know that, but they might be arrogant enough to believe they can manage situations that will inevitably spin out of their control. 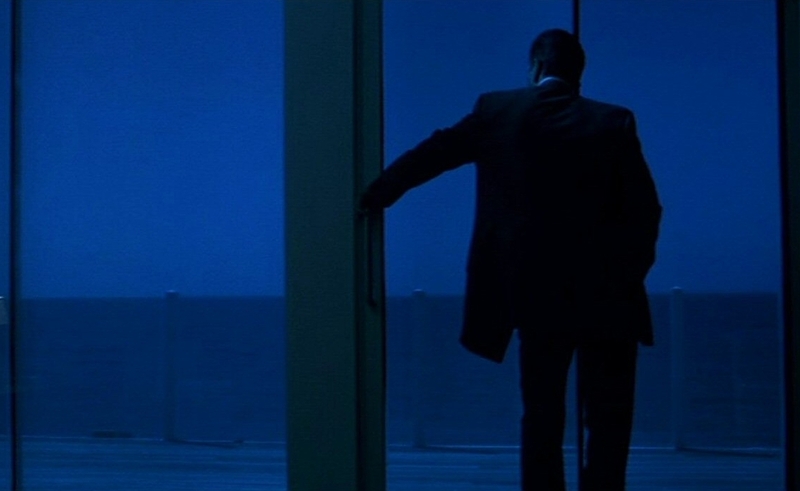 As a moviegoer, the pleasure of seeing a Michael Mann film is that he always has that view from the balcony, that God-like perspective on the entire landscape below. The world we know—and the world Neil and Vincent experience—isn’t nearly so orderly. Our Heat conversation continues in the Forum, which digs into the pairing of Robert De Niro and Al Pacino, and all the hype that surrounded it. And on Thursday, Chris Klimek explores the many ancestors of Heat, including the TV movie L.A. Takedown, Crime Story, and Mann’s cop friends.